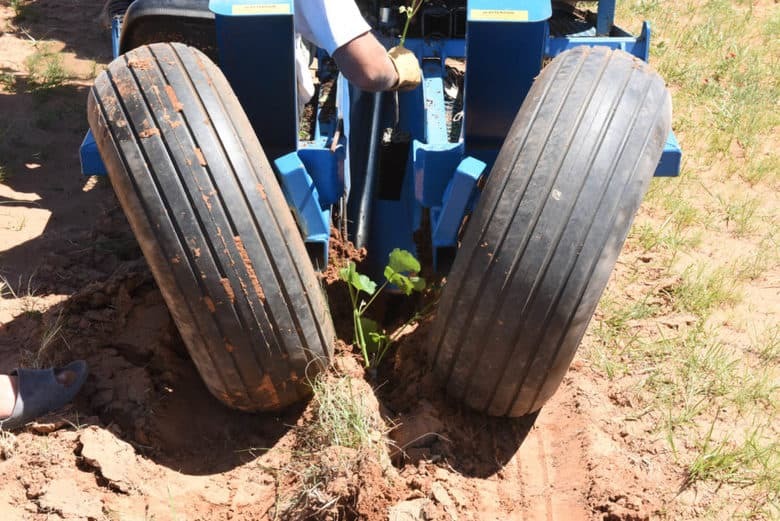 After almost a three week wait, we have finally finished planting Albarino grapevines. This brings the total to 4 acres Albarino and 1 acre Roussanne planted for 2017. The nursery in California that we normally buy our vines from did not have enough of the Albarino so, we had to look elsewhere. 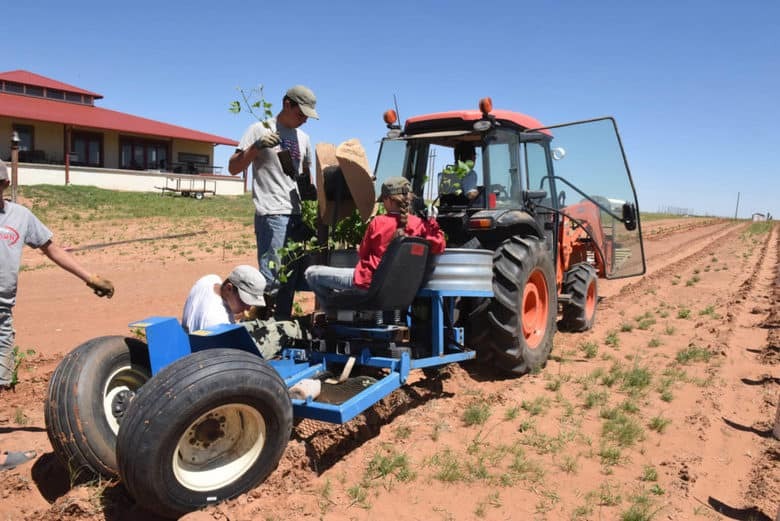 We normally use dormant bench grafted vines that have been grafted and planted in the field for one year. They are then dug up and shipped. One big advantage to these is that shipping costs are less. You can see in Planting Grapevines 2017 how the dormant bench grafted vines look like sticks with roots on them. What a difference green potted vines are! Some had 12 – 14 inch shoots! While that is wonderful, it does mean extra care must be taken while planting so that the shoots are not knocked off. 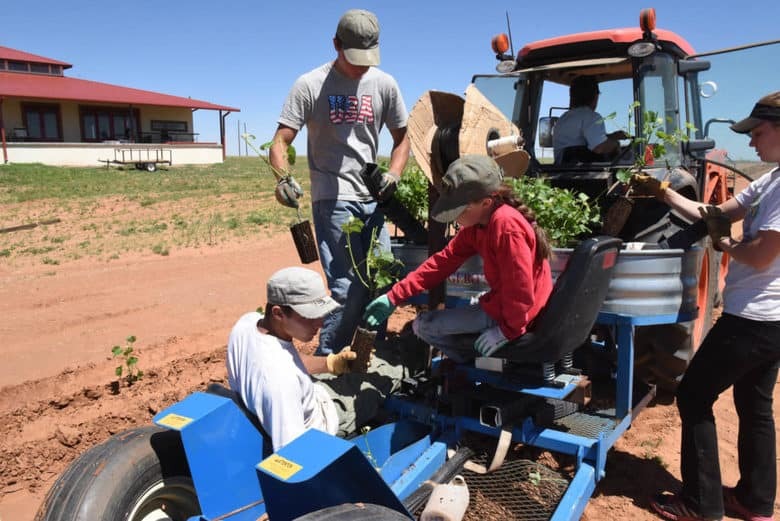 The set-up is the same with the planting rig. The potted vines are placed in the metal tank in front of the planters. We had two people unpotting and handing plants to the planter. 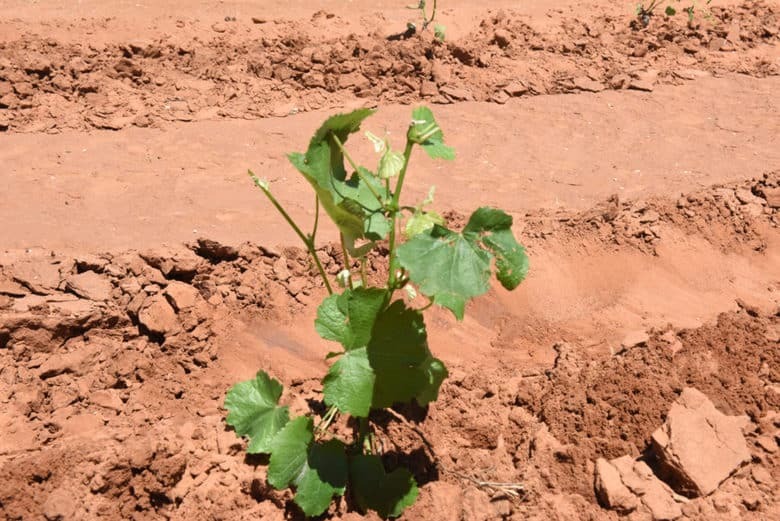 Planting Albarino just three three weeks ago, we used those vines as markers to know how to space the new plants. A plant is planted so that it is in line with the markers. 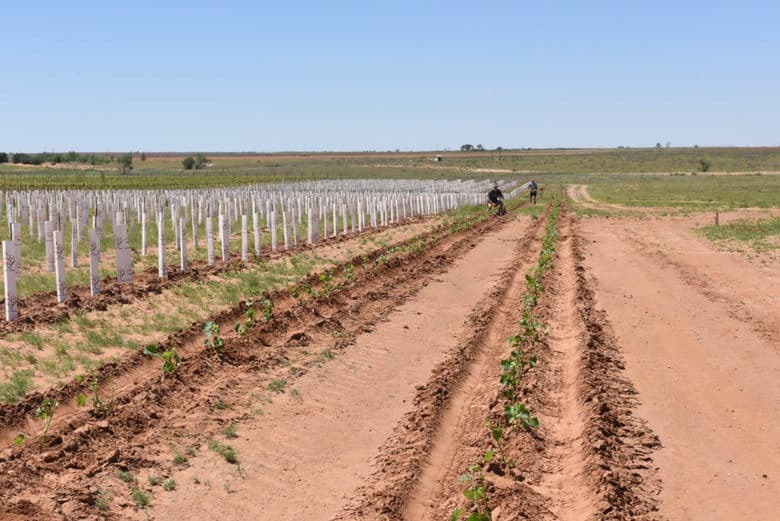 For more detail on planting and how we do it, see Planting Grapevines. 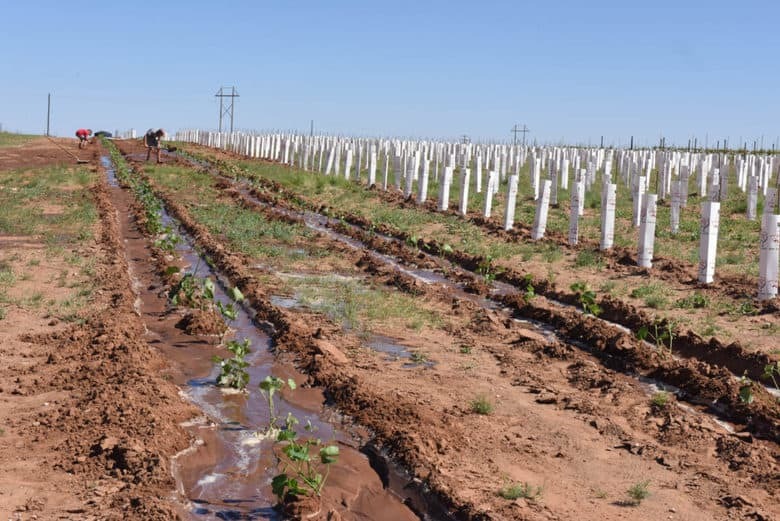 Below you can see the previously planted Albarino rows (covered with the white cartons) and the two rows of new plants to the right of them. 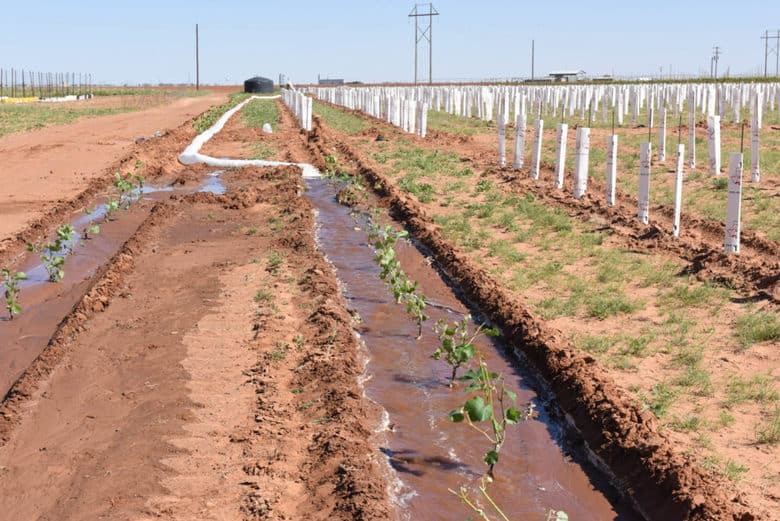 Since these vines already had such long shoots, we decided to row water the vines making sure they had plenty of water to get off to a good start. The sacrificial tape that will be used for a year or so was put down beside the vines but they need more water to start with. 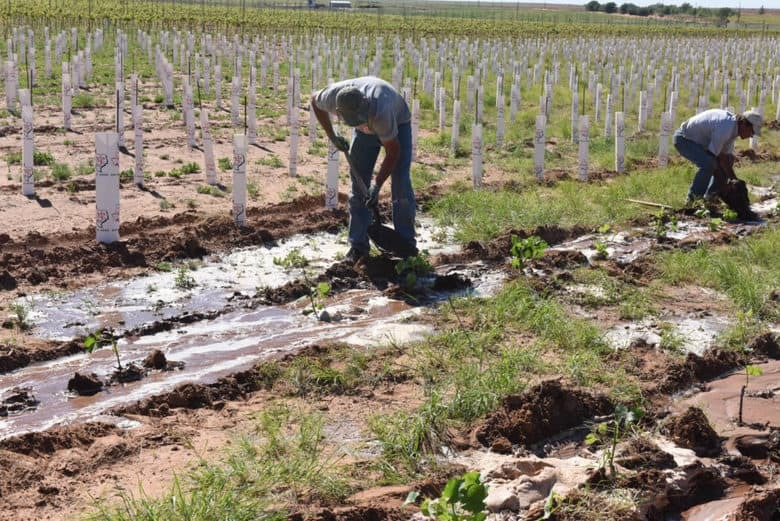 In the early years of the vineyard, we did not use sacrificial tape but row watered after planting. Boy, did this bring back memories. Our first year (2008) we planted five acres total. 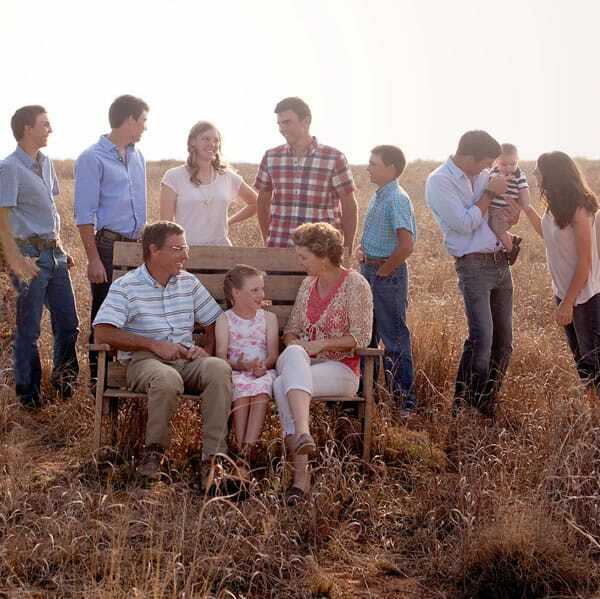 Since the wells were not strong enough to handle water for more than one acre at a time we planted one acre a day. After each day’s planting, we took shifts row watering them through the night. The water settles the dirt around the roots getting rid of any air pockets. The vines get a good drink of water to start them off. Here you can see a trench formed around the vines filling with water. The white “pipe” in the background is connected to the well. This pipe is soft plastic that can be reused. When we first started, the younger boys loved row watering because it was a great place to float boats. These boats were made of sorghum stalks and finally they brought their Playmobil boats out to the trenches! It is exciting and fun until the water breaks out of the trenches and you end up making dams and trying to keep it going the way you want it to! Most of us were barefooted and muddy by the time it was over. Those who stood firm in their shoes ended up with muddy shoes! 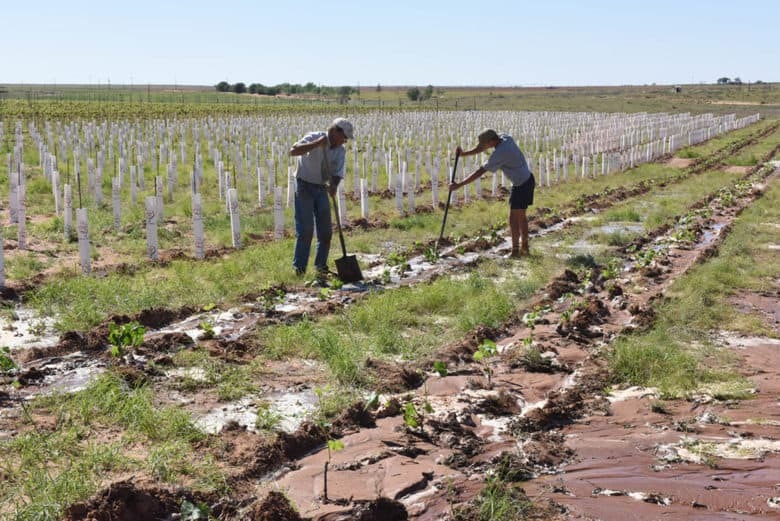 All in all, it was a great time planting Albarino. We talked about good memories, got a lot of exercise and all decided we never want to row water again!